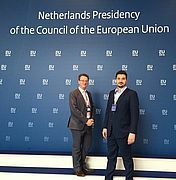 The conference under the title “The fight against doping in the EU legal framework: balance between effective anti-doping measures and fundamental rights” was held on the 15th of June in Amsterdam. Anti-doping has been defined as one the priorities in the field of sport for the Dutch Presidency of the EU, who has organized this event. The debate was focused around the questions of the impact of the new EU legislation on data protection on athletes and other current issues related to combating doping in sport. EUA General Secretary Jeff Reymond represented views of athletes on anti-doping system as an invited member of the discussion panel.